Deployment options that match your cloud Postgres needs. Running Postgres databases in the cloud is not one-size-fits-all. Depending on how much control or support you need, EDB has an option. When you need database performance assistance, EDB’s cloud solutions and teams are here to help. Event and incident management. Enable rapid detection, alerting, and action. Backup and disaster recovery. Create customized replicas and backups to meet your application availability needs. Performance tuning. As workloads grow and demands shift, monitor and tune your databases. World-class service. Access our global systems engineers around the clock. Simple pricing. No surprises or hidden licensing costs as our service includes all the software you need. 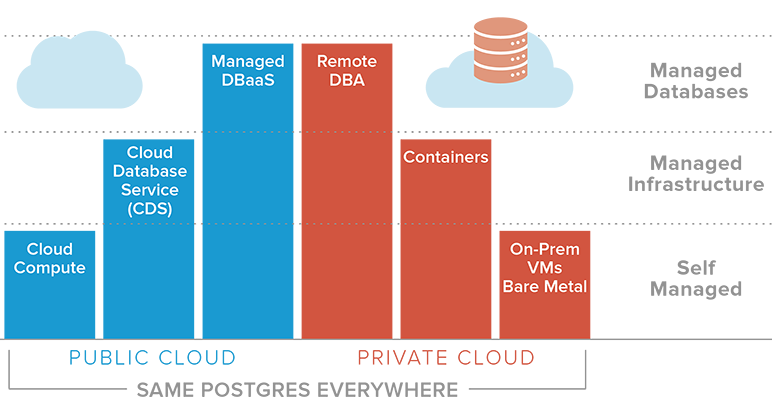 Having EDB as a partner to help us on this journey to the cloud will be vital, because the EDB DBaaS platform will enable us to migrate when we are ready and easily shift applications as workload demands change.